Males show a higher frequency of talon cusp than females. It may be unilateral or bilateral, with a predilection for maxilla over mandible, and more common in the permanent dentition. The most commonly involved teeth are the maxillary lateral incisors in the permanent dentition. This is a case report of a patient with the rare anomaly of facial talon cusp on the maxillary left permanent central incisor and a mild talon cusp on the maxillary right permanent central incisor. A 25-year-old male reported to the Department of Conservative Dentistry and Endodontics for the restoration of his carious teeth. Examination of the oral cavity revealed a well-defined talon cusp i.e 3 to 5 mm in width and extends in height from cemento enamel junction to 1 mm short of the incisal edgeon the facial surface of the maxillary left permanent central incisor and a mild talon cusp on the facial surface of the maxillary right permanent central incisor, and congenitally missing maxilary first pre-molars. Talon cusp of the maxillary left permanent central incisor extended from the cementoenamel junction to 1 mm short of the incisal edge from the crown labially [Figure 1]. Radiographic image shows a prominent V-shaped radioopaque structure superimposed on maxillary left permanent central incisor and mild V-shaped radioopaque structure superimposed on maxillary right permanent central incisor [Figure 2]. The affected tooth responded normally to electric pulp testing. The medical history was non contributory. Talon cusp usually occurs on the lingual surfaces of teeth. Prevalence rates of the lingual talon cusps as per studies by different authors, and references to case reports of facial talon cusps in literature have been given in [Table 1] and [Table 2] respectively. Talon cusp is usually asymptomatic, and often diagnozed as an incidental finding on routine dental examination. If symptomatic, talon cusp usually causes problems related to occlusion, speech and aesthetics. Associated grooves may lead to plaque retention leading to dental caries. If cusp is severely worn off due to masticatory forces, it may lead to pulpal exposure. Direct composite restorations can be considered for aesthetic correction of the talon cusp if present on labial surface. For the present case, no treatment was rendered due to lack of parental consent owing to superstitious beliefs. Occlusal Composite restorations were carried out for the posterior teeth which was the chief complaint of the patient. There was no data on the other affected family members and no history of consanguinity with the parents was present. Maxillary first premolar was missing in each quadrant. There were no clinical signs or symptoms of any genetic syndromes. No obvious developmental abnormalities were seen. For these reasons, the findings of facial talon cusp in this case should be considered as an isolated developmental abnormality. 1. Hattab FN, Yassin OM, Al-Nimri KS. Talon cups in permanent dentition associated with other dental anomalies: Review of literature and reports of seven cases. ASDC J Dent Child 1996;63:368-76. 2. McNamara T, Haeussler AM, Keane J. Facial talon cusps. Int J Paediatr Dent 1997;7:259-62. 3. Davis PJ, Brook AH. The presentation of talon cusp: Diagnosis, clinical features, associations and possible aetiology. Br Dent J 1986;160:84-8. 4. Oredugba FA. Mandibular facial talon cusp: Case report. BMC Oral Health 2005;8:5-9. 5. Sedano HO, Freyre IC, Garza de la Garza ML, Gomar Franco CM, Grimaldo Hernandez C, Hernandez Montoya ME, et al. Clinical orodental abnormalities in mexican children. Oral Surg Oral Med Oral Pathol 1989;68:300-11. 6. Rusmah, Meon. Talon cusp in Malaysia. Aust Dent J 1991;36:11-4. 7. Chu SY, Ki Y, Chu V, Lee CK. An audit of concomitant dental anomalies with maxillary talon cusps in a group of children from Honkkong. Prim Dent Care 2008;15:153-6. 8. Hamasha AA, Safadi RA. 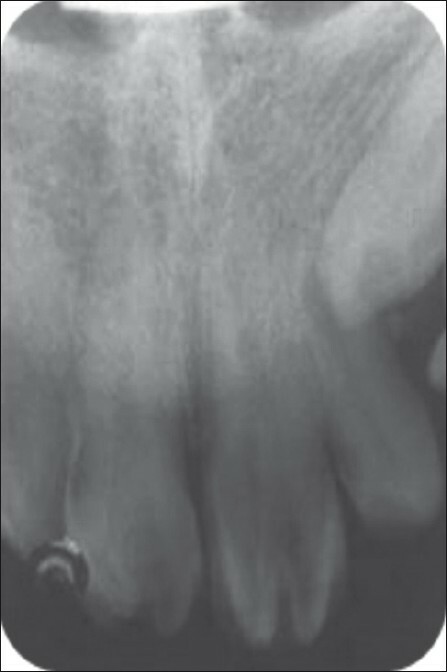 Prevalence of talon cusps in Jordanian permanent teeth: A radiographic study. BMC Oral Health 2010;20:10-6. 9. Glavina D, Skrinjaric T. Labial Talon Cusp on Maxillary Central Incisors: A Rare Developmental Dental Anomaly. Coll Antropol 2005;1:227-31. 10. Shashikiran ND, Babaji P, Reddy VV. Double Facial and Lingual trace talon cusps: A case report. J Indian Soc Pedod Prev Dent 2005;23:89-9.